Stabbed, choked, battered and pushed into bath water, a teenager is lucky to be alive after a savage attack at the hands of her boyfriend. Chloe Hogarth was mourning the tragic loss of her unborn baby along with partner, Aiden O’Brien, and they had been to a funeral on the day of the attack. After drinking vodka despite being on strong medication, O’Brien suddenly turned nasty when they returned home and launched a ferocious, unprovoked attack. A court heard he grabbed Chloe’s throat so hard she couldn’t breathe, banged her head off the floor and walls, pushed her under water in the bath, punched and kicked her, stotted her head off hard objects, swiped across her throat with a knife then stuck it into her abdomen as he strangled her and said “You are going to die”. The petrified 18-year-old suffered multiple injuries, had to be resuscitated and needed emergency surgery to remove her gallbladder and a doctor said if the blade had been just 1cm away from where it was, or had been at a slightly different angle, there would have been a significant risk of death. Such was the severity of the attack, O’Brien’s own dog went for him during the onslaught. Now the 25-year-old has been jailed for seven years at Newcastle Crown Court after he admitted wounding with intent. Mr Recorder Wheeler told him: “This was an extremely violent and nasty assault. “The injuries could easily have been life-threatening, if not life-ending. “It was more by good luck than anything that the knife stopped where it did rather than somewhere else where it would have resulted in the end of her life. The court heard the attack happened on March 23 this year. They returned to the home in Bedlington, Northumberland, where they were living, along with O’Brien’s mother. After having a bath, O’Brien then began making unpleasant remarks about Chloe’s family and she told him to stop being nasty. Mr Crook said: “That brought about an attack by the defendant. “He grabbed her by the throat and began to choke her to the point she couldn’t breathe and he banged her head off the floor and walls. “He dragged her to the bathroom and the bath water was still in there. He pushed her into that bath and tried to push her under the water and she was struggling to keep her head out of the water. The attack then moved to the kitchen, where it continued. Mr Crook said: “He punched and kicked her and hit her head off the bench in the kitchen. Chloe managed to run out of the house but he chased her down and continued the attack in the garden, repeatedly banging her head off the concrete. She grabbed him between the legs in a valiant attempt to get away and ran towards a local church. Mr Crook said: “He caught up and grabbed her round the throat, then held a knife to her throat and swiped it back and forward across her throat. By now badly injured and bloodied, Chloe bravely managed to grab him between the legs again and got away. She collapsed and was taken to hospital, where she was resuscitated and found to have various injuries, the most serious being a perforated gallbladder, which had to be removed. Mr Crook said: “The doctor said it was 1cm away from a significant risk of mortality. 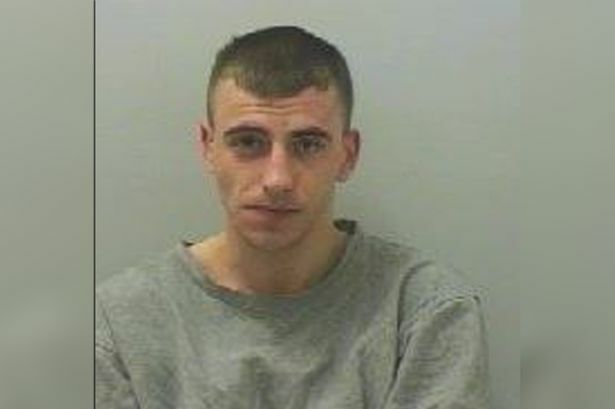 O’Brien, of King’s Road, Bedlington, pleaded guilty to wounding with intent and an unrelated affray from January. He was jailed for seven years and given an indefinite restraining order banning him from contacting Chloe. Tom Finch, defending, said the pair had enjoyed a good relationship before the attack and told how Chloe had to have a termination on Boxing Day last year. Mr Finch said: “That was a termination that both parents agreed should take place, not least because of the significant problems with the pregnancy and the fact the child, were it to have gone full term, would have been very very seriously disabled. “The fact that within weeks of the termination, this man tried to take his own life with an overdose, puts very much into the picture the vulnerable state he was in. “At this time the defendant was on two forms of medication. “After the funeral he and his girlfriend were both drinking and had drank to excess and that resulted in him behaving in a wholly uncharacteristic manner. This blog has been set up in order to bring attention to people who have been horrifically affected by the anti-depressant medication SSRI-Seroxat. SSRI’s are a “class” of drugs used primarily to treat depression and other so called “psychiatric disorders”. Seroxat has been the most controversial drug in this class of drugs and possibly of the past decade. While of course the terrible side effects and withdrawals from seroxat have been well documented in all mediums for some years now, the manufacturors of Seroxat, GSK, have not been . While researching Seroxat through forums on the internet, it was discovered that Seroxat is not the first drug or product made by GSK to have caused harm. This site aims to provide readers with portals to documents , links and research which might help them piece together the puzzles of the Seroxat scandal so that they themselves can come to their own conclusions . Note : This blog is in no way associated with scientology or anti-psychiatry organizations. It is written by a lay person and has no agenda other than to bring awareness and promote free and easy access to information about Seroxat/Paxil – Often the pharmaceutical industry and psychiatry like to dismiss and discredit blogs and information on the internet by labeling as “anti-psychiatry” or “scientology” affiliated. Most of the blogs (such as this one) -that I am aware of -are written by ordinary people who just want to highlight information and bring it to public consciousness. That is the purpose of this blog. It is an information sharing portal. Seroxat has damaged and affected many peoples lives, I think it is important to draw attention to the dangers of this drug, as I was on this drug and I think it is seriously dangerous and people should be warned, because I wasn’t. As a side note- It is deeply ironic for a pseudo-belief system such as psychiatry to discredit a pseudo- religion such as scientology. It is also ironic for psychiatry to accuse “anti-psychiatry” individuals of “fear mongering”. Psychiatry is rife with conflicts of interest and bias because of its entanglement with the pharmaceutical industry, both serve each others agenda, usually this is a monetary arrangement. Psychiatry also perpetuates the fraudulent biological mental illness paradigm which is based on feeding off peoples fears about themselves and the world around them. Psychiatry has done more damage to the reality of mental suffering than anyone else. The only people who can really be trusted are lay people (such as the author of this blog) who are trying to bring awareness of the dangers of SSRI’s meds, those who have taken the drugs like Seroxat know what its like. It is us who have been through the system, it is us whom have been damaged by the system and the drugs it promotes, it is our minds and bodies that have been poisoned , it is we who were naive enough to entrust ourselves to this system ,but it is also we whom dare to voice the truth about this corrupt psych-pharmaceutical complex.